I feel like I’m trying to Mo-del in that first pic and should be singing – easy, breezy, beautiful… yeah right. Blog pics can be a bit awkward but they have also taken disregarding what others think to a new level. I could go on for a while about things I’ve learned because of blogging.. but we will save that for another post and maybe a Thursday. This romper IS so easy breezy beautiful because of the lightweight material and blue etched design. I actually had TWO people ask me if I got it from Greece or Europe – “no”, I replied… just the Internet – it’s from Chicwish. 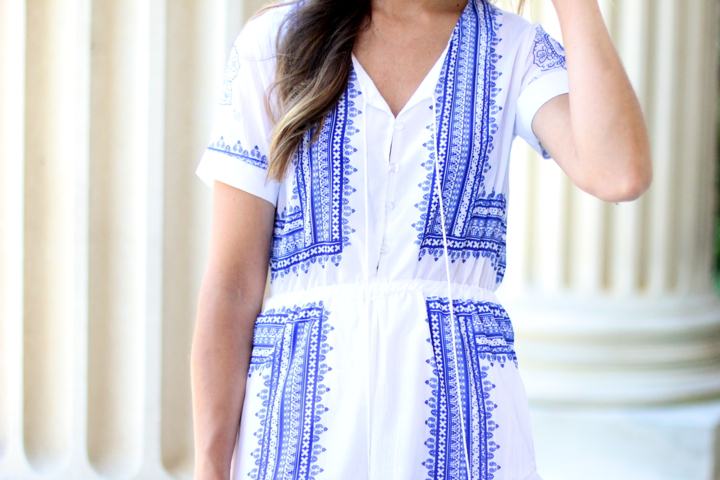 I love rompers because they add a casual element to a look and are as effortless as a dress. This weekend David and I saw a castle (snapchat: lc_steele) which turned out to be the meeting place of a secret society. It made me want to watch “the skulls” movie with Paul Walker. RIP. In fact the movie is on right now on my computer as I get ready. I’m so excited about this Thursday because my parents are coming up from Mississippi! I can’t wait to see them and just lounge in our house.